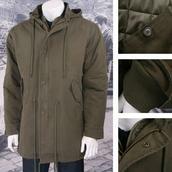 Fishtail Parkas - Despite its routes in the US Army, the fishtail parka has become an icon of British menswear. Firmly established as a symbol of mod culture in the 60s - when they were widely and cheaply available from army surplus stores - the parka became the choice garment for defending British men (and their impeccably-styled outfits) against the elements. Inspired by the M-51 or M-65 jackets (from 1951 and 1965 respectively), browse our selection of authentic fishtail parkas.